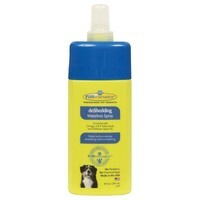 Furminator deShedding Waterless Spray 250ml is a non-drying formula that helps release loose, dead undercoat for easy removal with a FURminator deshedding Tool. A convenient way to clean and freshen your pet's coat, the spray requires no wetting or rinsing, and will also help to reduce shedding between baths. Enriched with Omega 3 & 6 Fatty Acids, vitamins, and proteins, simply spray onto your pet's coat and groom as usual to help support healthy skin and a shiny hair coat.